The position taken by the superfood advocates, is that these foods are needed to somehow supercharge ones’ health, or that optimal health cannot be achieved without these foods, which are views that reflect a lack of understand of health promotion. Consider the fact that most Americans are overweight and inflamed – this means that adding a cup of blueberries per day, or adding cinnamon or garlic to meals, will NOT have a “super” effect on the system and convert an inflamed obese person into a DeFlamed obese person or somehow stimulate weight loss. Before food modernization, remote societies were capable of eating only that which they grew, foraged, or hunted, and these societies were remarkably free of the degenerative diseases compared to their prevalence in industrialized nations. Arctic Eskimos largely ate fatty meats, such as whale, walrus, and seal. The Masai tribe in Africa lived primarily on meat, milk, and blood. Neither of these populations ate a single superfood and each population was healthy for generations. Consider hypertension, a very common condition in America. Fasting studies have demonstrated that a 2-week water fast can normalize hypertension or reduce it to pre-hypertension levels (1,2). In this case, no foods were consumed at all, just water. 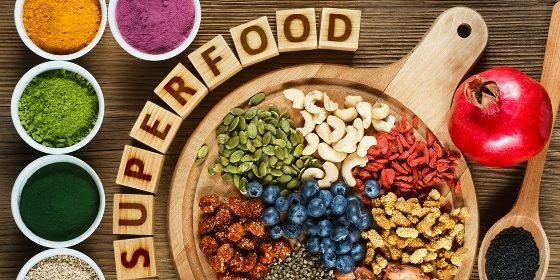 So the notion that we need a superfood to achieve a healthy state or to reverse an unhealthy state is obviously an overblown claim. The goal should be to avoid pro-inflammatory calories and replace these with anti-inflammatory calories, such as those incorrectly called superfoods, and only eat enough calories to achieve and maintain a normal body weight. The simple details of this concept and process are outlined in The DeFlame Diet. Goldhamer AC et al. Medically supervised water-only fasting in the treatment of borderline hypertension. J Alt Comp Med. 2002;8:643-50. Goldhamer AC et al. Medically supervised water-only fasting in the treatment of hypertension. J Manip Physiol Ther. 2001;24:335-39.